Physical characteristics: Blue jays are colorful members of the crow family. They have a crest of blue feathers that tops their head. Their rounded wings and fan-shaped tails are dark blue with black and white markings. Blue jays have pale gray faces and bodies. There's a "necklace" of black feathers around the throat. The bird has a long black bill, long legs and black feet. Adult blue jays range in length from 9.36 to 11.7 inches (24 to 30 centimeters). Birds weigh from 2.27 to 3.8 ounces (65 to 109 grams). The wingspan is 16 inches (40.54 centimeters). 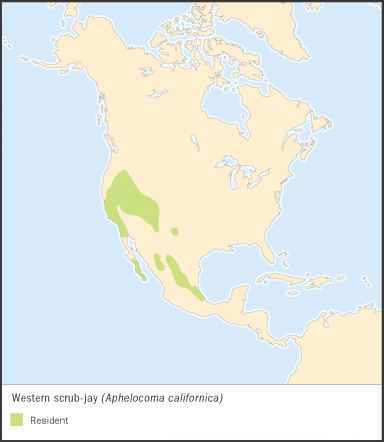 Geographic range: Blue jays are found east of the Rocky Mountains in the United States and Canada. Habitat: Blue jays live in woods, parks, and suburbs. Diet: Blue jays eat insects, nuts, and seeds. During the summer, they steal other birds' eggs. They add acorns to their diet in winter. Blue jays bury some acorns to eat in the future. 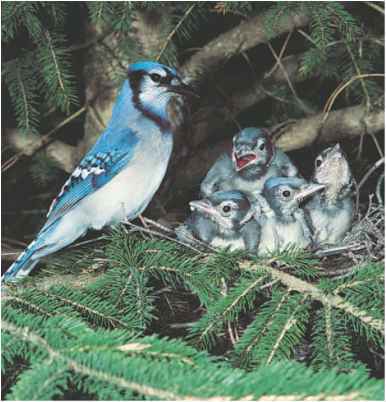 Behavior and reproduction: Blue jays frequently travel in small groups. 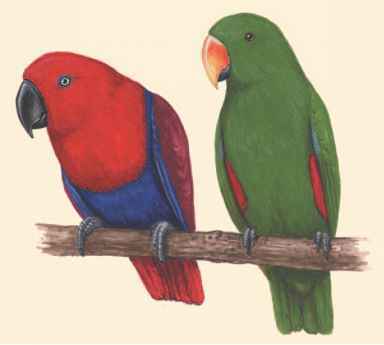 They live in trees and build nests of twigs, feathers, and roots. Birds are monogamous, and the female lays eggs during the months of March through June. The clutch of four of five eggs hatches in sixteen to eighteen days. Younger birds are grayer than adults. Blue jays and people: People admire the blue jay's beauty, and Toronto, Canada, named its baseball team the Blue Jays.